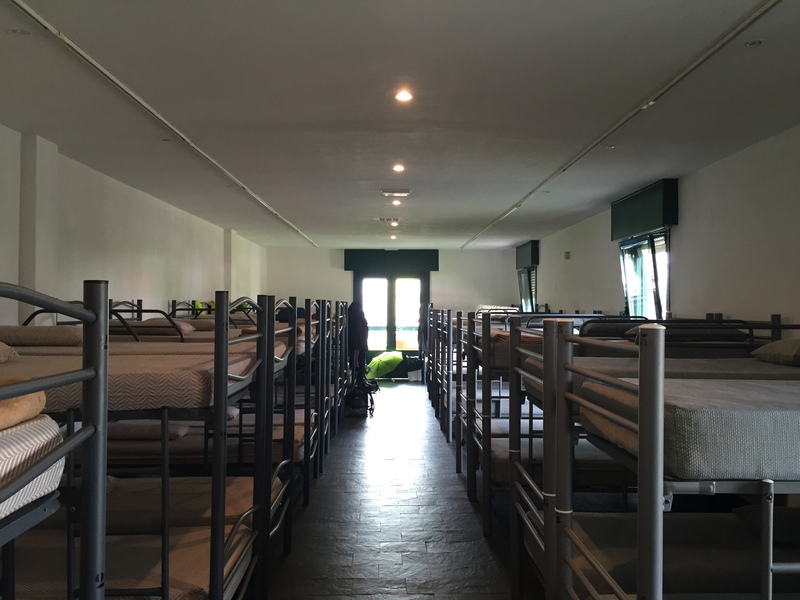 This albergue has two large dorm rooms with fifty-six bunk beds. When the hospitalero asked if I preferred a top or bottom bed, I said bottom please. “As everyone does,” he replied and walked me to a bed that was super close to other beds. In fact, a guy was sitting on my assigned bed and looking through his backpack. I dreaded the thought of sleeping in those tight quarters. I know that I would feel claustrophobic. Bottom beds are always first to be reserved, and in this particular albergue, they were assigned in order from the back of the room to front. The top bunk was so low that I wouldn’t even be able to put my legs up as per my ritual after a long day of walking. I went back to the hospitalero and asked if I could change to a top bunk. He smiled and said, “Yes, now you have many options and can pick any top bed.” I was so relieved! I saw a free bed at the far corner of the room, against a wall with windows on both sides and much more space between beds. 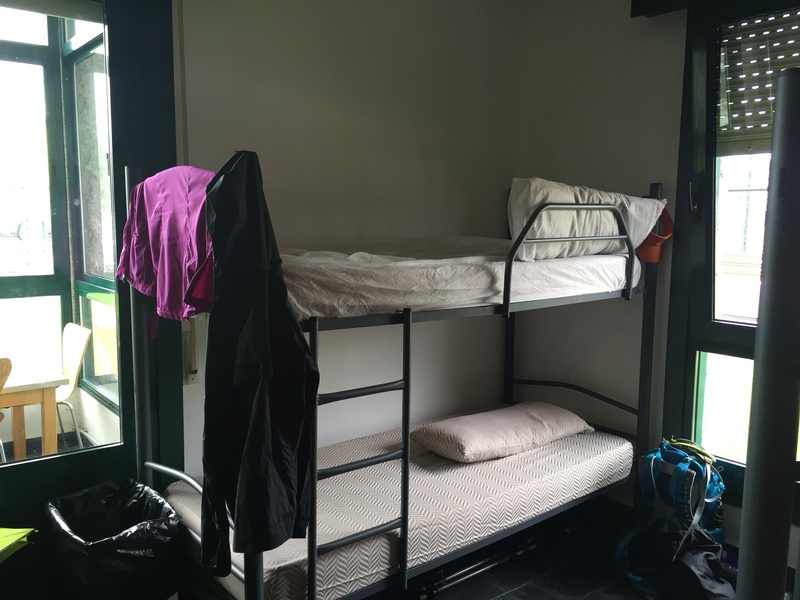 This was the first albergue that provided a disposable fitted sheet to cover the mattress and pillowcase. They were so thin and cheap that one ripped when I was tucking it into the mattress corner. (I guess this layer of protection helps prevent bedbugs from spreading.) I laid out my wonderfully soft and comfy sleep sack, rubbed my SPA cream on my legs and aching feet, and lay down with my legs vertically against the wall. Hooray for top bunks next to walls, windows, and space! After fifteen minutes of rest, I felt like going to the old part of town to get dinner and see the famous Chapel of the Pilgrims (Capela da Virxe Peregrina). I asked a woman in the lower bunk across from me if she’d like to join me. She seemed happy to be invited, and off we went to explore the old town. Guess what? Karin is from Germany, speaks perfect English, and is very friendly! It was her first Camino, too. She started in Porto and was walking the Camino during her two-week spring break. She explained that those two weeks in May are when most Germans travel, because there are a few bank holidays. It’s like taking two weeks off for the price of one. That probably explains why there were so many Germans on the Camino. We went into the beautiful pilgrim-themed church, where even the floor plan is shaped like a scallop shell. There is a connection to Fátima and this church, so I took out my rosary beads I bought in Fátima and knelt to say some prayers for family and give thanks for keeping me safe on this pilgrimage. We got to talking about religion, and she said that she was an atheist. I said, “We’ll get along fine, I’m married to one!” and we both laughed. After all that walking and praying, I was really hungry, so Karin suggested I pick whatever place I thought looked good. We agreed that she would select the next place. Adjacent to the church is a Sideria (cider house) with an outdoor patio. She had never been to one, so I explained that sidra (cider) is an Austrian specialty and that it has a dry, crisp taste. It’s supposed to be poured from above so the cider gets aerated. 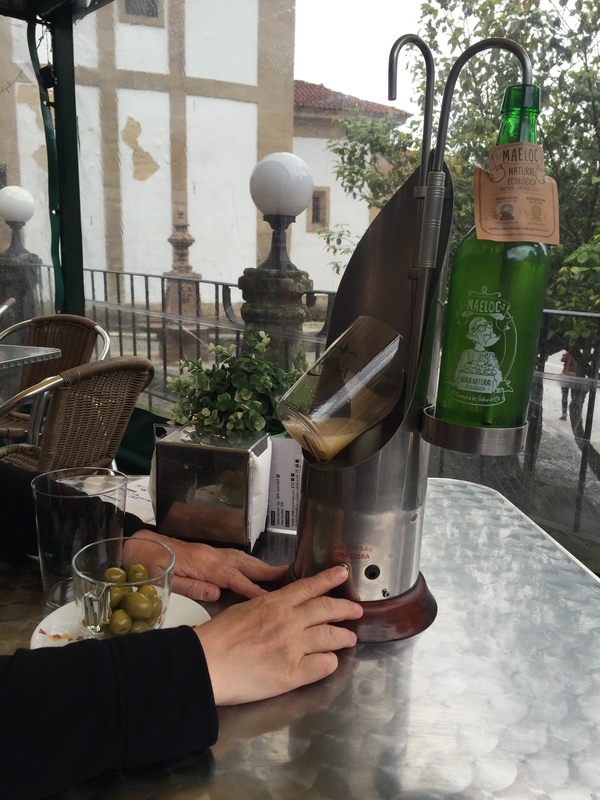 We ordered an organic sidra and the waitress brought the DIY version—a big bottle with a tabletop dispenser. The glass sits at an angle, and you push a button. The sidra comes streaming out fast into the glass, emulating the job of a pourer who would skillfully pour it from on high into a glass held low. If you have a chance to tour a sidre brewery, you can see this and possibly try it yourself. The waitress gave us a dish of green olives, which was just enough to stave off the hunger until our next stop. 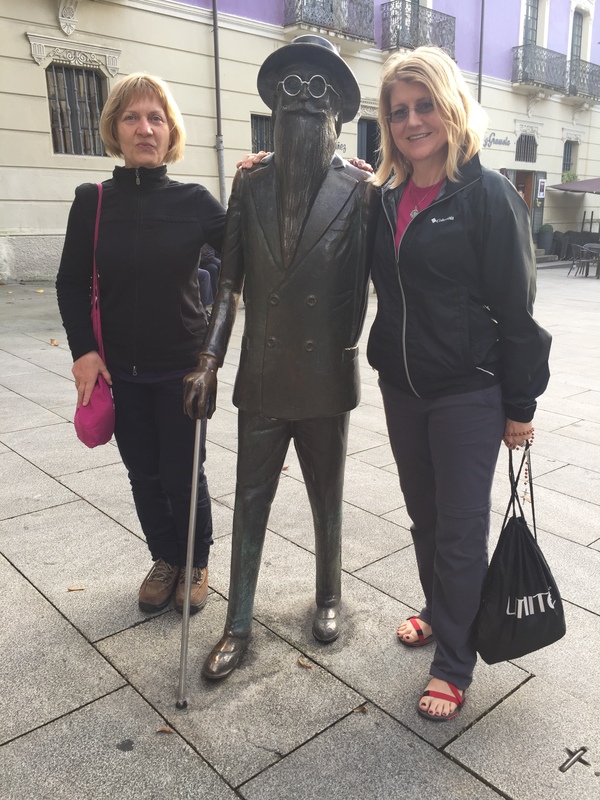 It was Karin’s turn to choose a place, and she spotted a wine bar where we enjoyed a glass of rioja and tapas. I told her about the Parador hotels and their menus for pilgrims and that there happened to be a Parador in Pontevedra. She wasn’t familiar with Paradors and was up checking it out. I navigated with Google Maps through the old narrow streets and alleys to the Parador. Karin was stunned by the posh lobby and didn’t expect a pilgrim menu here. We headed toward the dining room, which was empty as it just opened at 8 o’clock (Spaniards prefer eating dinner around 10). I asked about the special menu, and they said they didn’t offer the pilgrim menu at that Parador. Bummer. It would have been weird eating in the empty and overly fancy dining room, anyway, so we headed to the Parador’s bar. 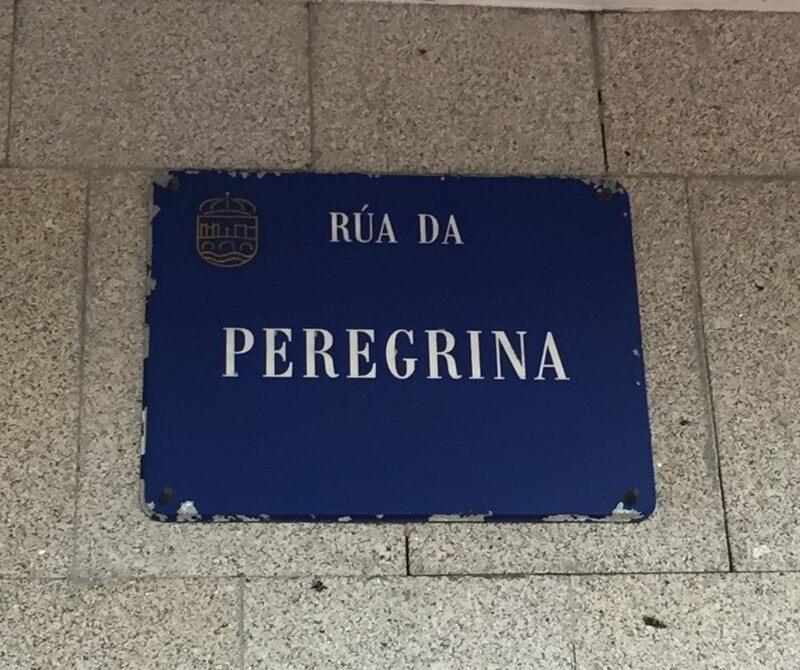 Happily, it was full of Peregrinas! A group of three American friends, a solo American who was going with the Spanish Steps tour, and two Austrian and Brazilian bloggers traveling together. I ordered the pulpo (grilled octopus) which is a Galician specialty. The bar didn’t offer a half portion and Karin is vegetarian, so I had a huge plate to myself. The preparation is simple–it is grilled in olive oil and sprinkled with sea salt and paprika. I ate a few of the bland boiled potatoes because I was hungry but left most on the plate to save room for the good stuff. 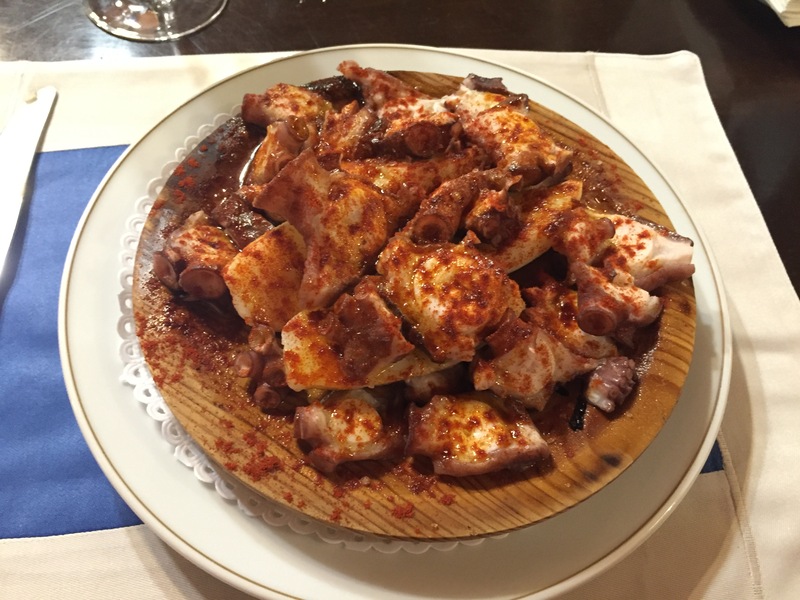 If you haven’t tried pulpo, Galicia is the place to order it. It’s served with a basket of delicious bread that you sop up the spicy pulpo oil with, oh, and a glass of Albariño wine to wash it all down. That meal was a splurge by pilgrim standards (20 euros) but so worth it, plus, the surprise of meeting other women travelers, all from different backgrounds, finding common interests, and having wine and a few good laughs. Karin now knows the secret of the Paradors for pilgrims. Suddenly Karin noticed it was 10:15, and we had forgotten about the lights-out curfew at the albergue. Oops! We paid our check and rushed out, hoping we wouldn’t be locked out. Then it started to rain. Hard. Luckily I had my rain jacket and umbrella. We huddled together and headed toward the albergue, about 20 minutes walk from the Parador. Anyone in their right mind would duck for cover in a bar and wait it out. But not us, for we had a curfew. Karin said she saw a back door when she did laundry earlier and thought if the front was locked, this door might be open. Fortunately, when we got back there were a few smokers hanging out near the front entrance, so the door wasn’t locked. 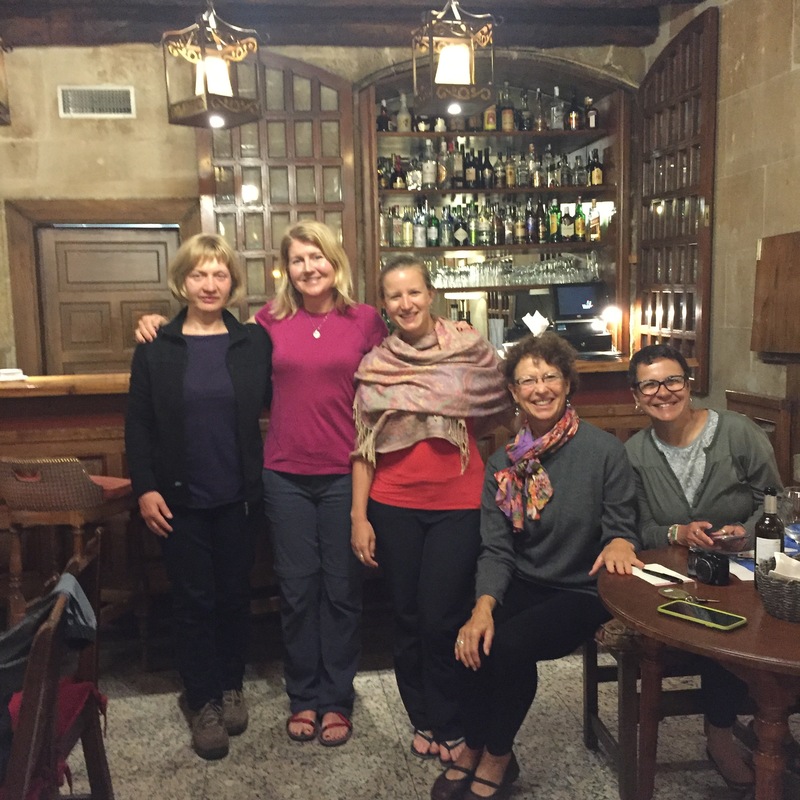 Another “Camino provides” moment! However, the lights were out in the bunk rooms. I used my phone screen (not flashlight app—too bright and it zaps the battery) to find my bunk on the far side, being careful not stumble into anything. Karin quietly got into her bed, but I gathered my toiletries and empty water bottle and headed to the bathroom. People were still up, and there was a drunk girl brushing her teeth very slowly while staring into the mirror. Pilgrims like to party. I went back and noticed the lower bunk hadn’t been claimed, so I slept there instead of the top bed. It was a fun and adventurous evening in Pontevedra with my new German, atheist friend. 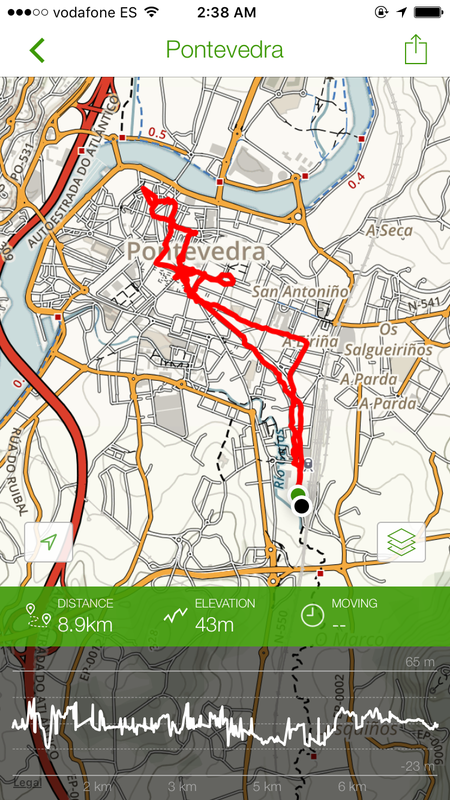 Our evening jaunt to the old town added another 9 km to my day, so 31.5 km total. As you can see from the map below, the albergue isn’t very close to the historic part of town. Next time I’m there, I’ll find a place closer to the center, that doesn’t have a curfew! 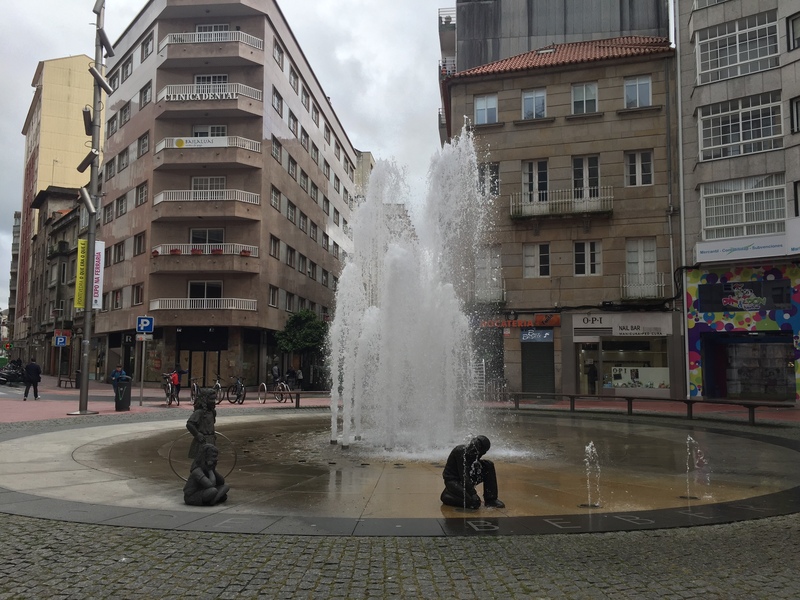 Up next, Walking Day 4: Pontevedra to Caldas de Reis. Laurie: I am reading every word eagerly and am amazed at your stamina to post so many wonderful pictures with notes. 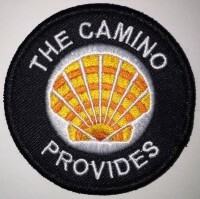 Perhaps one day I will walk the Portuguese camino. Thank you Mary! It’s a labor of love. 🙂 Much easier to write this from home rather than writing from the Camino. Julien, thanks! Pulpo is an acquired taste. I never ate seafood growing up, but now I love it! Hi Bonnie, Thanks for the kind words. Thanks Pablo! While on the Camino, I jotted down notes on my phone, and did share a few photos on my own facebook timeline. But the memories are still fresh so when I see each photo I can recall the situation or story behind it. I met some great people! Thank you Bonnie! It was so nice to meet you. Glad you had a buen Camino too! Thank you for your very good information. Nice post. It is very informative post. 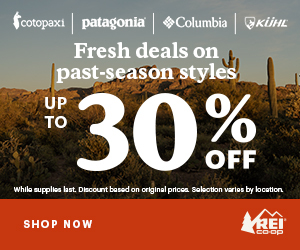 I follow your blog for getting information. I am waiting your next blog. I so enjoy your journal.at the moment I am a Camino virgin but I plan to rectify this in 2019. Currently I’m nursing a broken back in hospital ( after carrying out some DIY on my home roof ) and researching and walking the Camino is a great past time and target. The details in your journal are excellent.